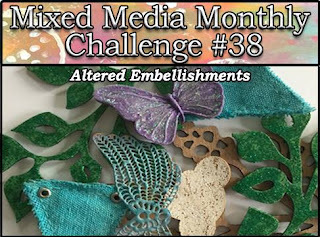 …Altered Embellishements! This is going to be a fun one! What can you think to do with your own stash of embellies to change them up a bit? Our generous sponsor this month is UmWowStudio. The owner sent us all chippies designed by our very own Lynne Forsythe to use for our projects! Join in our challenge and you will have a chance to win a $30 gift certificate plus free shipping at UmWowStudio! I didn't want to get too dimensional on the cover because it is going to see some use! I think I'm going to spray it with Scotch Guard too to help it repel dirt etc. I started off with making a mist from permanent ink using Eileen Hull's Color Box Blends, color - Leaf (see how HERE). All the materials I've used on this are permanent and waterproof when dry. I used a leaf stencil I have to mist the leaf pattern on the front (and back). For the stamping I used Rubber Dance stamps (see list below) and Ranger Archival Ink. I cut a plant tag using the Phrase, Bloom & Plant Marker die. I also dug deep into my stash for some Tim Holtz Grungeboard letters to spell the words 'garden'. I altered those with paint and Distress Embossing Powder. 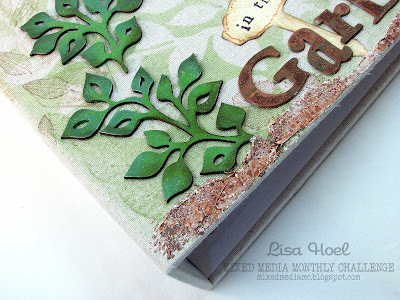 The super cool chippies that Lynne designed I altered with various embossing powders and distressed with archival ink. I glued them on with super strong glue and added some crackle paste 'dirt' with little glass beads pressed into it for more texture. When it was all dry I colored it with a wash of brown fluid acrylic paint. Thanks for stopping by and I hope you have a great week! Head on over to the MMM challenge post to see some inspiring projects and meet the two new members of our Design Team. We will be having a really big mid-month post too so keep your eyes open for that on the 15th! Sizzix links in this post are affiliate links which do not affect the price you pay but allow me to earn a small percentage of the sale. Thanks! Beautiful garden journal! I love the soft leafy background and those altered leaves pop right off the cover with these gorgeous deep greens! So pretty! Simply gorgeous, love the cover page with different hues of green! such a fresh and fairy scene, I love it! That is lovely - that butterfly is awesome! 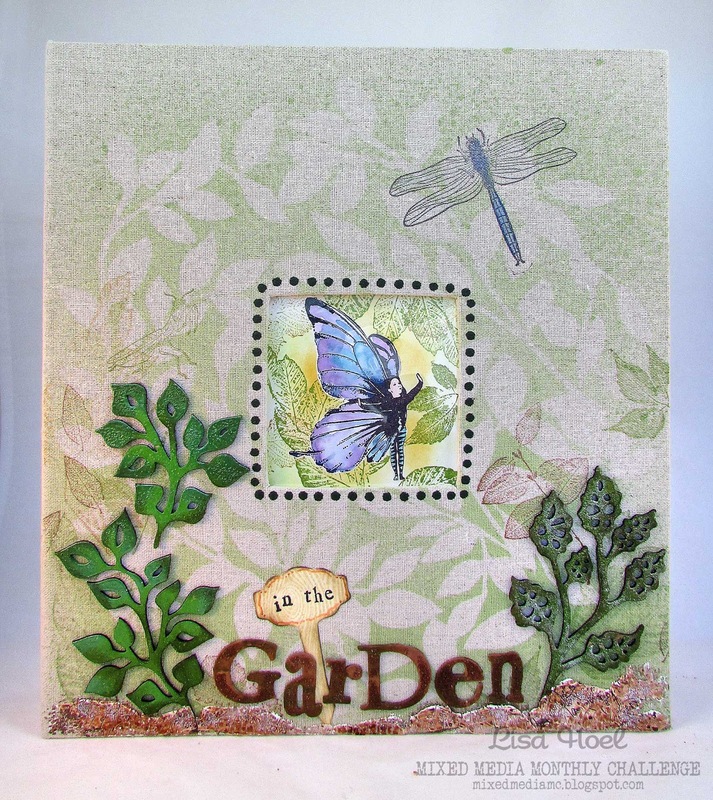 Love your little fairy in the beautifully designed garden you created. Beautiful cover for your binder, love those soft colors. Love this so pretty, those chippies are very cool! Really like your backgound! Lovely, lighter than air feeling here, with the fairy and the dragonfly just floating away in all that sunlight.